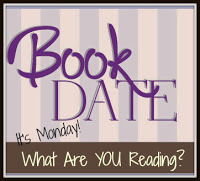 Book By Book: It's Monday 3/26! What Are You Reading? I missed What Are You Reading Monday last week because my husband and I took a short (but wonderful!) trip to Annapolis (see my photos here), so I have two weeks' of reading to catch up on here. It's been a hectic two weeks, with two more snowstorms (enough already! ), our trip, lots of family stuff, getting the kids off to spring break, and a busy weekend. I finished reading Alias Grace by Margaret Atwood, a Christmas gift from my husband (I suggested it to my book group). Since I just read my first-ever Atwood novel last year (The Handmaid's Tale), I was glad for the chance to read more, and this novel was entirely different. It's a historical novel, based on a real-life woman in the mid-1800's in Ontario who was sentenced to life in prison for murder. The question of whether she is guilty or innocent is central to the story. We had an excellent discussion about the novel - and couldn't agree on Grace's guilt or innocence! Next, I read The Optimistic Decade by Heather Abel, a debut novel due for release on May 1. I am reviewing it for Shelf Awareness and also interviewed the author last week (also for SA). The novel was engrossing and unique, and the author had some great background stories to tell about it. It's set in the 80's and early 90's in western Colorado at a Utopian summer camp, and it explores how different members of an activist family try to make a difference in the world, as well as the land use conflicts in the west. I really enjoyed it - I will share both my interview and review when they are published in May. This is also one of the selected books for Booktopia, an annual book event in May in VT that my mom and I enjoy attending, so I am looking forward to meeting the author in person there. Now, I am reading another book for a Shelf Awareness review and author interview and for Booktopia: My Ex-Life by Stephen McCauley. It's about a gay man who moves in with his ex-wife in order to help her get her life together and help her daughter apply to colleges. It's wonderful so far - insightful but also laugh-out-loud funny. Apparently, McCauley is a popular author of many novels, though this is the first one I've read, so I'm looking forward to interviewing him tomorrow. I also squeezed in a middle-grade graphic novel, Graveyard Shakes by Laura Terry, which is a fun story that mashes together the real-life challenges of two sisters starting at a new boarding school with the otherworldly events at the cemetery next door. I enjoyed it. I finished listening to The Freakling, book 1 of the Psi Chronicles by Lana Krumwiede, a middle-grade/teen/YA fantasy dystopian novel that I downloaded free from SYNC last summer. The novel is about a society where most people have telekinesis powers and those who don't are sent to a colony, where they have to do horrible things like feed themselves with forks, tie their shoelaces, and pick things up to move them! It's an intriguing concept, and I enjoyed it, even though this sort of fantasy story isn't always my favorite. Now, I am listening to Ramona Blue by Julie Murphy, a YA novel I have wanted to read since its release about a year ago. It was worth waiting for! I am loving this story of a teen girl in coastal Mississippi who is something of an outsider in her town and school. She's over 6 feet tall, is openly gay, and lives in a trailer. It's wonderful so far - endearing, compelling, and real-feeling - and I love Ramona. My husband, Ken, finished NightSun by Dan Vining, a novel I recently reviewed for Shelf Awareness. It's a detective story set in 2025 that combines mystery, suspense, and dystopia. Now, Ken is reading The Late Show by Michael Connelly, one of the books I gave him for Christmas. It's the start of a new series by Connelly (author of the Harry Bosch series) featuring a young female detective named Renee Ballard. He says it's great so far. Our son, Jamie, 23, was reading book 6 in the Wheel of Time series by Robert Jordan, Lord of Chaos. He loves this epic fantasy series. He has probably finished it by now, and I'm sure he took some books on spring break with him, but I have no idea which ones. He has stacks and stacks of new books after spending about $150 in Christmas gift cards entirely on books! Yup, he's our son. Graphic Novel Review: The Dam Keeper by Robert Kondo and Dice Tsutsumi - a fairy tale-like story based on an Oscar-nominated animated short film. Saturday Snapshot: Annapolis - highlights from our recent trip - beautiful town! I had a peek over at the photos of the trip what a beautiful relaxing place it looks. All your books sound fascinating although maybe a little too heavy for me! It was, Kathryn! We really enjoyed Annapolis. I think you'd like My Ex-Life - it's very funny and it touches in some serious issues but never loses its sense of humor. I have my Ex-Life on my list ... haven't gotten to it yet, of course. The Optimistic Decade sounds good. I think you'll like both of those! I really enjoyed them - can;t wait to meet the authors at Booktopia! It looks like you and your husband had a wonderful visit to Annapolis. We haven't had snow, but we have had rain and hail like there is no tomorrow! I'll be looking our for Ramona Blue and Graveyard Shakes. We did, Cheriee! What a wonderful & picturesque town! We finally had a lovely, warm, sunny day today, though some patches of snow remain in the shady spots. Hope you get a reprieve from your nasty weather soon! I've been really interested in hearing more about The Freakling, but you've sold me on Ramonda Blue. I'm adding it to my TBR list right now. Have a great week! I am LOVING Ramona Blue! The main character is just wonderful & so endearing. And the book just gets more & more interesting. I'm very intrigued to read about The Optimistic Decade--looking forward to your review. I've read two Atwoods--I loved one (Hag-Seed) and didn't care for the other (Blind Assassin), but I have Alias Grace so I might read it based on your comments. It's a good one, Jane, and very thoughtful. Hope you enjoy Alias Grace - I keep hearing people say that Cat's Eye is another good one of hers! I’m glad you had a good discussion about Alias Grace. I loved that book. I like your photo. It makes me want to go on vacation. Have a great week! Thanks, AJ! Yes, I enjoyed both the book discussion and the trip! I just finished One of Us is Lying and am starting A Girl Like That. YA books for spring break! I;m enjoying my YA's on audio right now - I haven;t read either of those two yet!